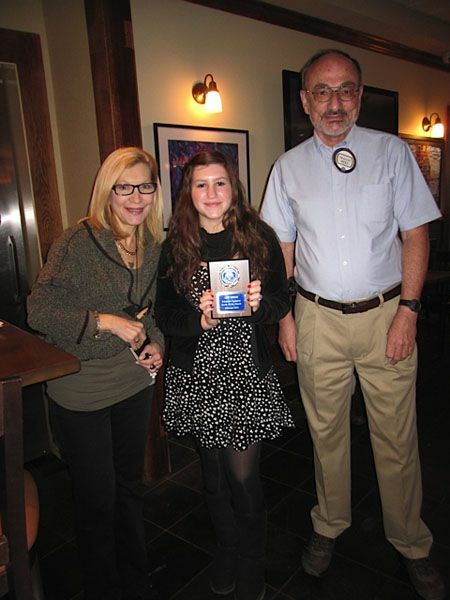 Young Angels President awarded Optimist Club teen of the month. Pictured here at Steve and Lenny's breakfast ceremony. Wally Mees introduced Brook Dougherty, head of Young Angels of America, who told us a bit about her organization—in the last 10 years they have raised $0.5 million for charitable work including a project in Watts—and told us a bit about our Student of the Month, Amy Dersh. She has been in Young Angels of America for several years and working with young people; she is a senior at Pali High, is a photojournalist, and is the only Caucasian member of the Black Student’s Congress at Pali. Amy, accompanied by her parents, Steven and Jennifer Dersh, thanked the Club and received a standing ovation for her accomplishments.